Oceaner DYNO45 dynamic apnea freediving wetsuit, 1 mm thick for pool training and competitions. Engineered to maximize function and durability. Silk screened logo(s), includes screen charge. 1 Color. 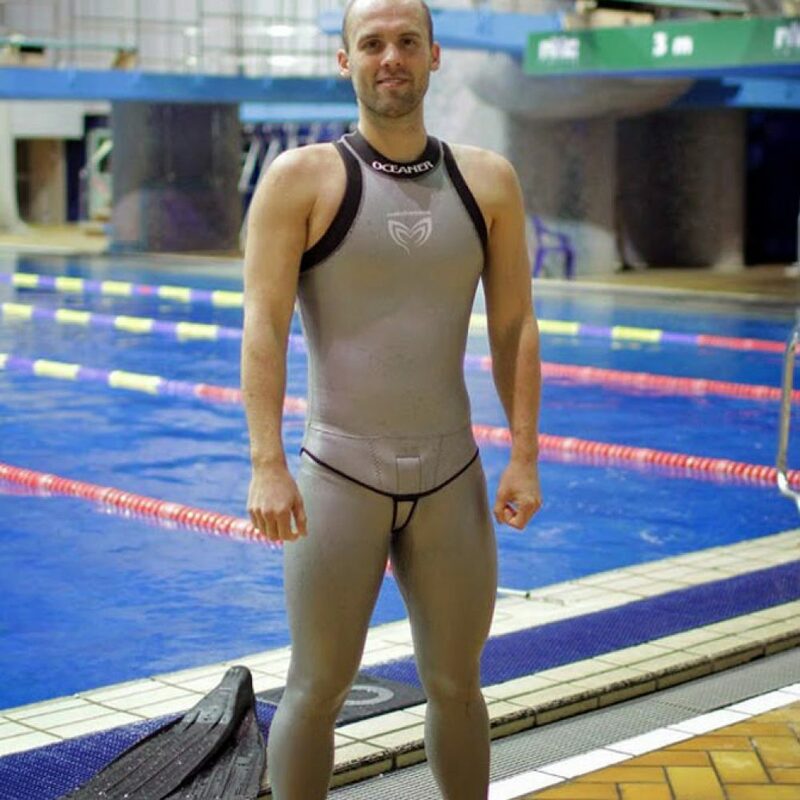 Oceaner dynamic apnea wetsuit for pool freediving training and competitions. Available in 1mm and 1.5 mm thickness. Engineered to maximize function and durability. All OCEANER Freedive suits are made with very high quality Yamamoto 45. Unlike most of the world’s polychloroprene (neoprene), this unique revolutionary material is an ecologically friendly, composite material made from limestone mined in Japan. Yamamoto 45 is regarded as the highest quality material available for competitive freediving wetsuits. The DYNO45 - 1mm- is constructed with Yamamoto 45 materials. The main inner surface is silky smooth lycra finish which creates an friendly “on again - off again” function of a suit that sees repetitive usage. The exterior surface is skin with an SCS slick finish which offers a desirable smooth low Drag coefficient exterior. 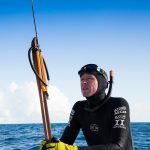 This, together with the OCEANER designs and features creates the most advanced Freedivie training suit on the planet. 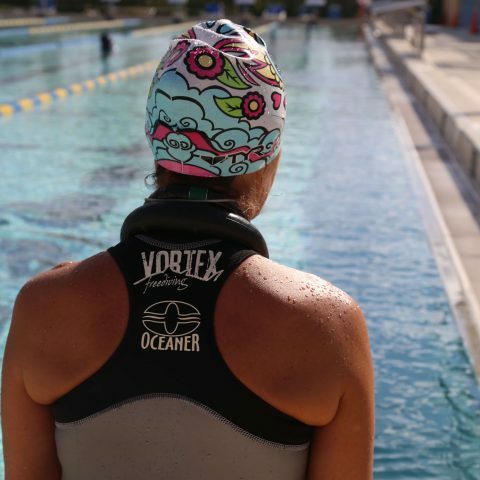 Oceaner suits are designed to be skin tight yet offer the ultimate in motion freedom. The open sleeve and narrow back allows easy maximum arm movement. The neck opening is high and tight while the open edges of the arm and neck openings have reverse material seals which further limit unwanted water entry. For added edge strength all outer edges are reinforced with a Lycra binding. The hip length suit jacket is secured back to front with a Velcro clasped “Beaver Tail” This high use, high stress “tail” is constructed using once again the uniquely developed composite material, reinforced to add strength and tear resistance where it is most needed. This layered composite design provides the necessary required strength without sacrificing the stretch and thermal properties needed to perfectly seal the Jacket to the Pant. The main inner surface is a silky smooth lycra finish that’s comfortably offers ease of donning and removal. The upper waist panel is a reverse material creating a more positive sealing surface. Ankle edges are reinforced with a Lycra binding. For a freediving wetsuit to do it’s job most efficiently, it should fit like a second skin. Check the standard size charts below to determine if a standard size suit will be right for you. If your basic measurements do not fall within the standard sizes, you should send us your measurements and have the suit custom tailored made. Chest 31" - 35" 33" - 37" 36" - 40"
Hips 34" - 38" 37" - 41" 39" - 43"
For any questions or assistance feel free to contact me.